Millions filled the streets and chanted “Not My President,” hoping that their protests would force out the country’s corrupt leader. Now, it appears they may be succeeding. What sounds like the dream of progressives across the United States is actually the scenario currently playing out in South Korea, where President Geun-Hye Park was impeached by the National Assembly late last year and is on the verge of being ousted. Because of the many similarities between her and Donald Trump, the situation in South Korea should serve as a warning to the new US president. As the daughter of Chung-Hee Park, the former South Korean dictator whose authoritarian regime is credited with spurring the country’s economic resurgence in the 1960s and 70s, Geun-Hye Park grew up in the nation’s spotlight as part of a wealthy family. When she went into politics, she enjoyed the backing of those still loyal to her late father, who was assassinated in 1979. Like Trump, Park benefited greatly from instant name recognition and could count on positive coverage from the conservative wing of the media. Now, however, following various blunders and scandals involving corruption, Park is facing impeachment after months of mass demonstrations against her administration, and her approval rating has dropped to an astonishing 4%. The breaking point came when journalists found out that she was illicitly sharing confidential national security documents with Soon-sil Choi, a family friend, whose father Tae-min Choi was a cult-leading, pseudo-religious figure. The close relationship between the two families gave him inordinate influence and he was deemed “Korea’s Rasputin.” Moreover, there was no reason to share national security information with his daughter. Within days of the story breaking late last year, there were large street protests demanding Park’s removal. 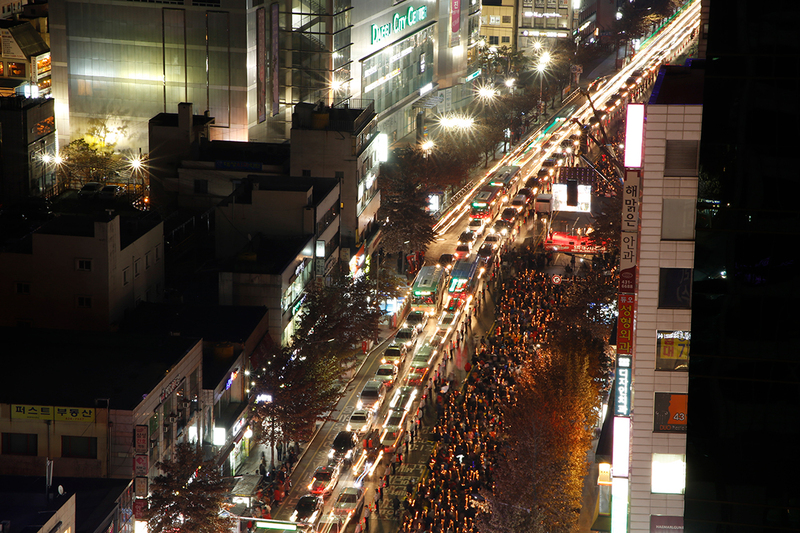 At the height of the demonstrations, which began last November 12, two million people gathered in Seoul and across the country, week after week. That’s 4% of the population. To put it in perspective, in order to match these protests based on the US population, ten million women would have participated in the Women’s March on January 21 and would continue marching weekly. Protest for resignation of President Park in Daegu, South Korea in 2016. Photo credit: 파훼 / Wikimedia (CC BY-SA 4.0). Like Trump, Park was elevated to her country’s highest office by an electorate still hurting from the 2008 recession and itching for a change. What put Trump over the top was arguably his aggressive and savvy use of Twitter, coupled with assists from Russia’s Vladimir Putin, WikiLeaks and FBI Director James Comey. For her part, Park benefited from the Korean National Intelligence Service’s unlawful rigging of the election in her favor. It hired “trolls” to set up numerous fake Twitter accounts to create the illusion of widespread public support for Park. Similar to the fake news stories flooding US social media accounts ahead of the election, Park’s powerful supporters spread rumors about her opponents. Until recently, Park was supported by many of South Korea’s major media outlets. One of them, The Chosun Papers (the country’s largest daily), had likely been aware of critical components of the scandal all along, and simply kept quiet. Critics perceived this as a deliberate attempt by the media to execute its own master plan for puppeteering Park. 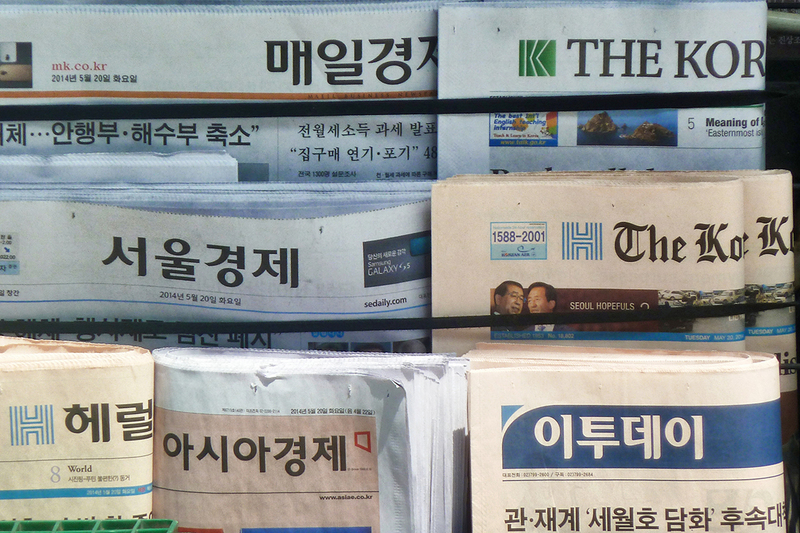 In South Korea, the government openly favors some media outlets with its support, and those outlets reciprocate by reporting what the government wants. Accordingly, Freedom House downgraded the South Korean press from “free” to “partly free” in its 2011 Freedom of the Press Index. This status indicates a government that often misleads its citizens into believing that their country is more democratic than it actually is. In 2016, Reporters Without Borders ranked South Korea 70th (out of 181 countries) in its World Press Freedoms Ranking — a drop of 10 spots from 2015. The media is now paying the price for its complicity. The public believes that the South Korean press has been acting, at best, as a bystander, and at worst, a collaborator. When White House advisor Stephen Bannon, who previously ran Breitbart, a far-right news service, told the press it should “keep its mouth shut,” it was viewed as a shocking affront to freedom of speech. A similarly authoritarian wish to suppress free expression is manifested in Park’s infamous “blacklisting” of 9,000 artists and public figures who were allegedly shunned by the government. Newspapers in Seoul, South Korea. Neither Park nor Trump seems shy about outright favoritism in their treatment of individuals or of select media channels. And widespread disillusionment with the media is widespread in both the US and consistently shared by South Koreans. The creation of a “partly-free” mediascape is one of the levers of modern-day authoritarianism, says Daniel Tudor, a former foreign correspondent for The Economist in Korea. He cites The Chosun Papers as an example of a co-opted press that received heavy funding and advocacy during Chung-Hee Park’s regime. Its large presence in South Korea may parallel the ascendancy in the US of Breitbart News, with Bannon now at Trump’s side. 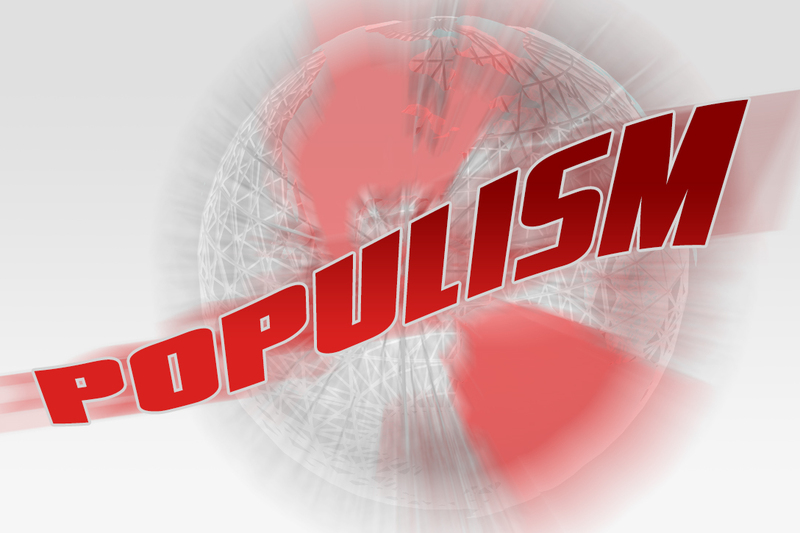 Trump’s supposed “rejection of the elites” — the key to his populist appeal — is part of a global movement signalled by “politics in Turkey, the UK (Brexit), the Netherlands, China, Russia, and everywhere, really…,” Dr. Nicholas Cull, of the University of Southern California’s (USC) Annenberg School for Communication and Journalism, told WhoWhatWhy. Park garnered support from a varied spectrum of political party affiliations. Conservatives were beguiled by expectations that she might provide for Korea an economic boost akin to her father’s achievements. The reason why most of these countries, though, cannot completely escape their long histories of royalty is because a substantial number of regular people seem to be gripped by a powerful nostalgia, or yearning, for precisely that which their forebears collectively rejected in the transition to the modern era. This aligns with his reference to “white nationalist nostalgia” that pervaded Western countries historically, and which Trump boldly echoes. Support for Park/Trump hinges on “people’s love for authoritarianism,” as Tudor explained to WhoWhatWhy. Additionally, both Park and Trump enjoy a substantial measure of support from rural conservatives, often of lower socioeconomic classes. “T.K.” is the tag for a Korean-American attorney who runs a blog (A.K.A. for Ask A Korean!) filled with shrewd political commentary on both the US and South Korea. T.K. told WhoWhatWhy that he had at first believed that President Park might be “different from her father.” In any case, Park was, said Dr. Hwang, a convenient “figurehead” to serve entrenched interests. 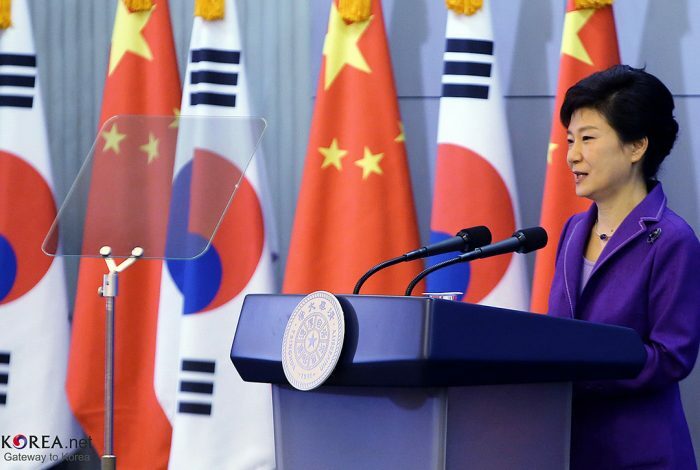 In contrast to T.K.’s initial expectations (which were shared by many Koreans), Park inherited all of the corrupt infrastructure from her father’s era (click for his extensive briefing on the Park-Choi scandal). Trump’s transparently pro-corporate economic thrust offers similar nationalistic aspirations. Trump’s failure to sell off his businesses may make it difficult for him to avoid conflicts of interest and will likely result in personal enrichment from his position as president. Park also is no stranger to conflicts of interest, including fostering and maintaining inappropriate relationships with the giant Korean conglomerate Samsung. It is not surprising that Park has placed her inner circle of accomplices and personal acquaintances in powerful administrative positions. Trump has already been called out on similar moves. With so many similarities, it seems prudent that the new US president and his team take a close look at Park and what is happening in South Korea. She is a prime example of voters not looking kindly on populists who promise to return a country to greatness but then fail to deliver and get caught up in scandals and allegations of corruption instead. 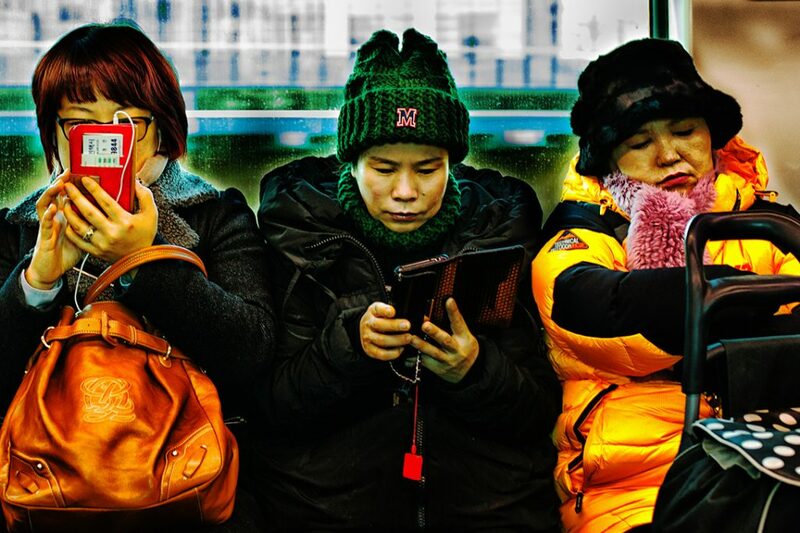 Related front page panorama photo credit: Adapted by WhoWhatWhy from Geun-Hye Park (Republic of Korea / Flickr – CC BY-SA 2.0) and Donald Trump (Gage Skidmore / Flickr – CC BY-SA 2.0).